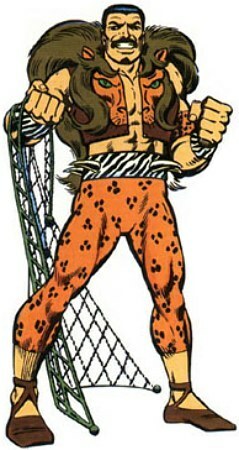 Kraven is an expert fighter skilled in many forms of martial arts. He is a trained hunter and is skilled in the use of all the weapons he uses. Kraven is also a master chemist that specializes in herbal poisons and paralytics. Finally, Kraven is able to train wild animals and often has one or two lions or tigers in his lair that respond to verbal commands. Enhanced Abilities: Kraven has enhanced strength, agility and endurance due to the effects of a mutagenic potion. Weapons: Kraven has a number of weapons he uses in his hunts, these include: Axes, Spears, Whips, Darts, Nets, Manacles, Poisons, Narcotic dusts and Electro blasters. Born into an aristocracy that had come to an end, Kraven became one of the world's greatest hunters to fulfil his sense of lost nobility. But he became bored and wanted a different kind of trophy on his wall. The trophy was Spider-Man's head. Kraven gained power by drinking rare and exotic jungle elixirs. These elixirs gave him the strength and speed of a savage beast-- all the better to catch Spider-Man with.